Wooden twigs wrapping around the glass with delicate leaves and small budding flowers. The final touch is elegant gold swirls trailing around the design. 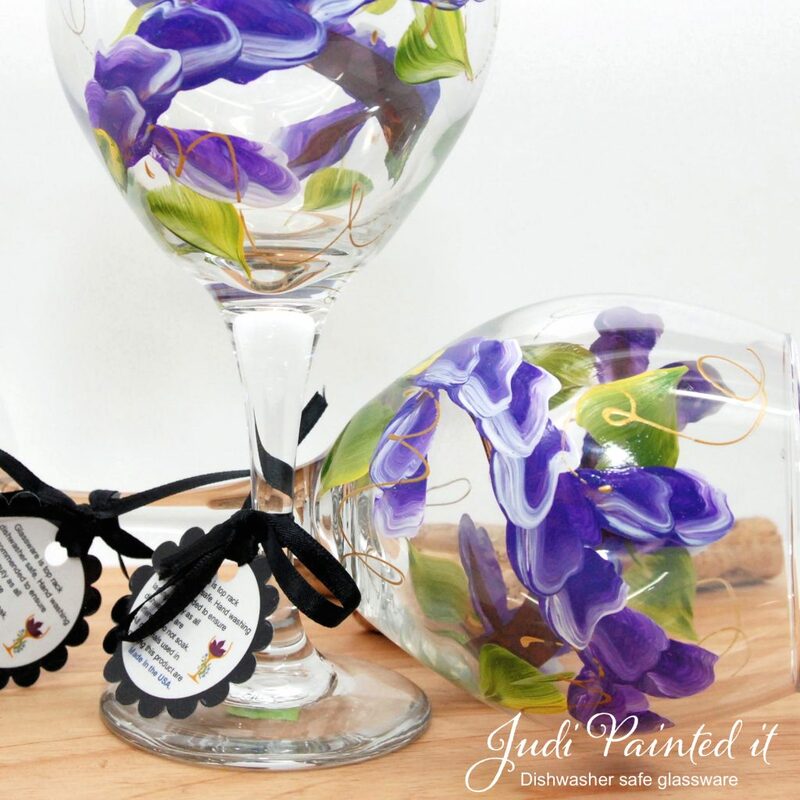 Wine glasses are a whopping 20oz and measure 8.5 x 4 inches. They are extremely durable. You’re NOT purchasing thin, fragile glass. All glassware is hand painted with enamel glass paint, followed with a clear coat for extra durability and then baked making them top rack dishwasher safe. From the glasses to the paint, scalloped care tags, everything is made in the USA. All glassware comes with a small scalloped care tag so the recipient knows they are top rack dishwasher safe. All photos are stock, your item will have slight variations due to being hand painted. 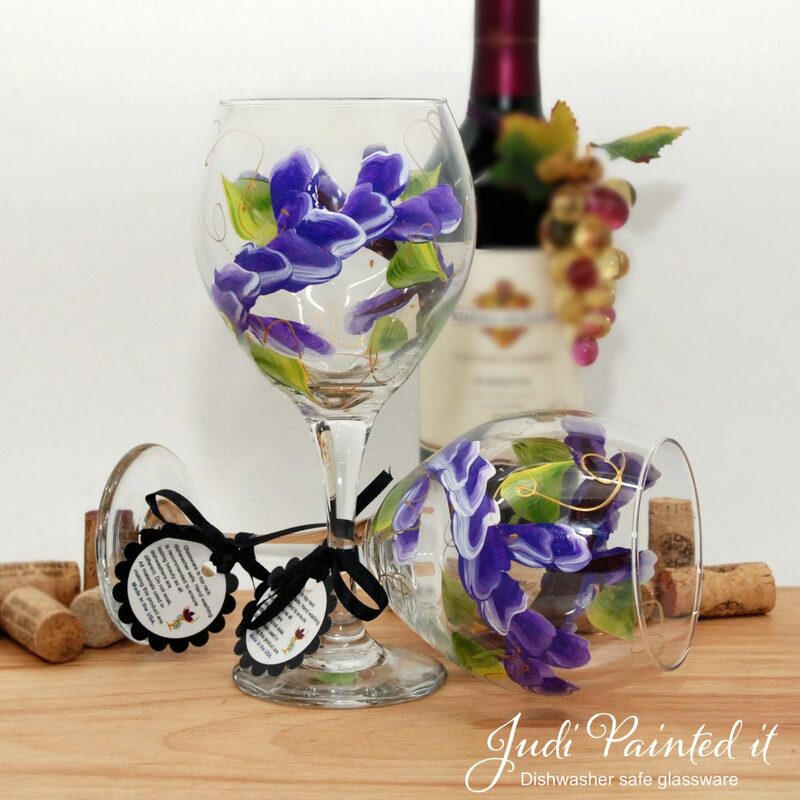 Feel free to make your own custom set by mix and matching colors eliminating the need for wine charms. We have a large assortment of colors to choose from. If you don’t see the color your looking for just ask us if we have it. Gift boxes are included with every wine glass purchase. During the check out process is where you will list how you want the glasses personalized FREE of charge. All text goes on the base of the glass in black unless you specify another format. Most items are pre painted in stock and ship within 3 days. For back-orders please allow 2 – 6 weeks or call our studio at (215) 757-1020 if you need a specific date. Presentation is everything, glassware can make a big impact on the overall decor of your event. Make them pull double duty by using as event decor and take away favors.